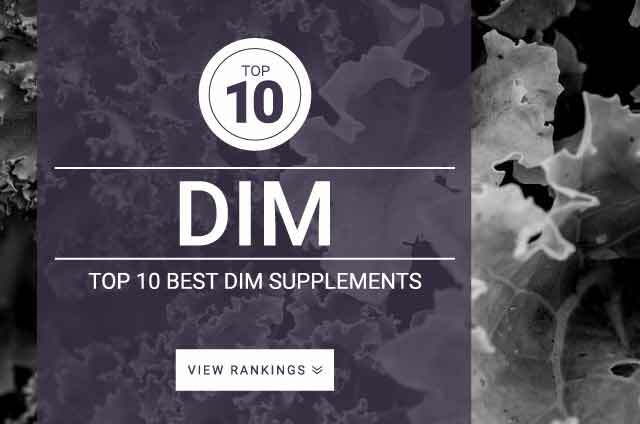 DIM is a molecule produced as a metabolite from the breakdown of indole-3-carbinol (I3C), which is found in cruciferous vegetables such as cauliflower, kale, broccoli, and collard greens. DIM is best known for its effect on estrogen metabolism and for its potential as an anti-cancer agent. Studies have found that I3C and DIM enhance the body’s ability to convert estradiol, the active form of estrogen, into its inactive metabolites. This activity may help both men and women in regulating the amount of circulating active estrogen in the body, which is of particular interest for diseases that involve estradiol. Research has shown that patients who supplement with DIM experienced reduced levels of estrogen compared to control. In men, DIM has been found to help regulate aromatase activity, which is the enzyme that converts androgens like testosterone into estrogen. The impact of DIM on estrogen activity has been especially important in breast, thyroid, and prostate cancer research. Studies have found that DIM helps to decrease the active hormone levels that allow cells to proliferate and eventually become tumors. Because of this, while DIM cannot cure already existing cancer, it can help prevent cancer development and enhance the treatment for those with cancer. DIM is not the same as its precursor, I3C. While research has found that the two have some similar actions in the body, I3C is quickly metabolized into DIM when ingested. DIM is not a replacement for current hormone therapy or estrogen inhibiting medications such as tamoxifen. A physician should be consulted before beginning a DIM supplement if combining it with another hormone medication. This supplement may affect how quickly the liver breaks down other medications. A physician should be consulted to determine if DIM is an appropriate option in combination with current regimens. One should not take DIM if pregnant, as it may interrupt efficient hormone levels for proper development and lactation. Good natural whole food sources of DIM can be found in broccoli, cauliflower, and kale. Typical doses of DIM range from 100-300mg daily, although an optimal dose is not known. Some studies have used 500-1,000mg daily. A physician or dietitian should be consulted to determine appropriate individual dose if considering this option.